If you are looking adopt a distinctive-looking hairless kitty, don't forget to check out local Sphynx cat rescue shelters. You can save on breeder fees and give a wonderful pet a loving home. While this breed of cat is friendly, playful and unique, the Sphynx is not for everyone. Many times a Sphynx is mistakenly adopted by an owner who does not realize the amount of care and maintenance these cats require. Due to their lack of fur, a Sphynx can become greasy, or oily to the touch. This oil can stain furniture or clothing if the cat is not properly groomed and cared for. Too much grooming, however, can lead to skin problems, meaning that a Sphynx owner will need to pay close attention to the cat, its health and bathing needs. Sphynx cats are also frequently thought to be hypoallergenic, due to their lack of fur. Unfortunately for those owners who did adopt one of these cats for that reason, this is untrue. While the cats don't shed large amounts of fur like other felines, they still shed skin cells and droplets of saliva, both of which contain allergens. Owners who have adopted a Sphynx thinking that the cat may be a companion for a highly allergic family member may have to surrender the cat. Rather than surrendering a Sphynx to a standard animal shelter, if you find that you need to give up your pet, the best place for him is in a pure-bred shelter that caters to the Sphynx breed, or in a Sphynx cat rescue shelter. A shelter that deals with Sphynx cats on a regular basis will make sure that these cats get the grooming, socialization and attention to their health that the breed requires. A Sphynx shelter can also educate potential owners to help ensure a proper match. A shelter well versed in Sphynx information would ensure that a potential owner knows how high maintenance the breed can be, and that the cat is not hypoallergenic, despite its lack of fur. If you are looking to adopt a Sphynx, a Sphynx shelter will provide you with a cat that has been well cared for, and who is in the best possible health. If you are interested in adopting a Sphynx, or find that you need to surrender one, the best place to start your search is with local veterinary clinics. Vets are typically kept up-to-date on the shelters and programs in the area, and can direct you to a pure-breed or Sphynx shelter. Many shelters will not ship cats, due to the stress it places on them, and many more will also not allow far away adoptions, as the stress of travel can be too upsetting for the cat. Likewise, if an adoption were to happen out of state, and the cat needed to be surrendered again, the adoption agency would likely not be the first place considered. Therefore, a local shelter, or one within a few hours traveling time is likely the best fit. 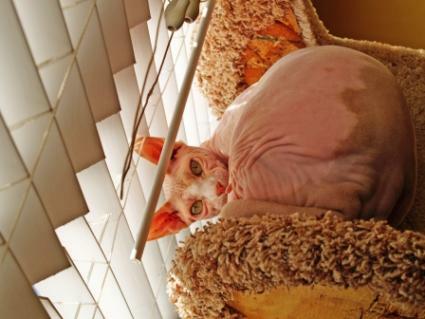 The Sphynx is a breed of hairless cat, the result of a natural, genetic mutation. A farm cat in Toronto, Canada was discovered without hair or fur like other cats, but with only a thin covering of fuzz over its skin. This cat was cross-bred with other breeds, such as the Rex, to develop the hairless breed of cat known today as the Sphynx. The breed is still being developed, with introductions into the gene pool from domestic shorthair cats to help strengthen the breed. While many Sphynx cats are healthy, there are several more that have been born with heart conditions, ear problems such as severe wax build up, or joint problems. Many of these health issues were brought to the breed through the mating with the Rex breed. Sphynx cats which are the result of a mating with a domestic shorthair may have fewer health problems. While a breeder is always a great place to find a pet, consider using Sphynx cat rescue shelters if you are planning to adopt a sphynx cat. And if circumstances require you to surrender your pet, locating a shelter which specifically handles the Sphynx breed will ensure that your cat receives the best possible care, while awaiting her new home.